Hungary, something is eating you. Being a writer, artist, you can’t help but see the symbolic significance in everything. It’s the blessing and the curse. It’s cloudy, gray and raining as I step out of the Franz Liszt airport. Its name has been changed only recently. It used to be called Ferihegy but now is named after one of Hungary’s greatest composers who could make music soar. Ferihegy was named after Ferenc Xavér Mayerffy (1776–1845), the former owner of an estate who established vineyards and contributed to the development of viticulture in Pest-Buda. “Feri” is a diminutive form of Ferenc while “hegy” means hill. In fact the area is almost totally flat but originally there was a 147 m high sandy hillock which was levelled in the 1940s during the constructions works of the airport. Only in Hungary do you have a mountain that’s only a hillock. Eh Montreal? Z is waiting for me. I brought one suitcase, backpack of books, a briefcase of notebooks and a cold that won’t quit. We do a bit of catching up and soon Z turns to the political scene in Hungary. Z likes to joke but he is basically a person who likes to talk about things that mean something and now in Hungary everything has significance. The drive-talk is like an overture, contains bits and pieces of everything to come during my stay. We talk of politics, culture, family and food. The sky clears and somehow our conversation turns, I don’t remember how or why, to physical culture and the YMCA. He is both surprised and pleased to learn that the Village People’s song has homosexual undertones. A, his partner, who is a a PhD candidate working on Alice Munro, comes home later. I tell you these Hungarians know more about us than we do about ourselves. Listen to me saying “us”. I guess I am not Hungarian anymore. And yet. A teaches English to students at Eötvös Lorand University, the McGill of Hungary. She also teaches English privately. Other university teachers do the same to make ends meet. 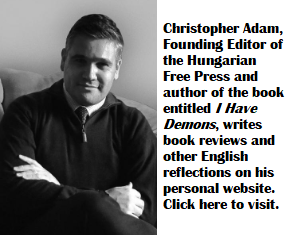 In cowboy capitalist times in Hungary, education and health services are the first to be cut and educators and health care workers and those needing their help are one of the first victims. Quelle surprise. Later that night, we watch TV and see a discussion show on which I first see and hear the nurse in black. This articulate and insightful nurse has started to wear black to bring attention to the deplorable conditions in the Hungarian hospitals. This is made worse by the contrasts of the billions spent by the government on building soccer stadiums, on statues to rehabilitate fascists and helicoptering ministers’ friends to avoid traffic. Helicoptering, I learn, has now become a term to highlight government ministers’ sense of entitlement and corruption. There is no admission of wrongdoings and no sense of shame about it by the accused ministers. There is opposition and protesting Hungarians are great at symbolic & theatrical gestures. The 56 flag with a hole in it, the whistle symphony, and the two tailed dog posters to name a few. We could learn from them. Although the opposition is very creative, it can’t seem to topple the government in elections because like The Left everywhere it is so fragmented that the Right can divide and rule. It reminds me of the scene in The Life of Brian in the Colosseum. The fragmented left is brilliantly satirised as the Judean’s People’s Front hating the People’s Front of Judea, The People’s Front of Judea hating the Judean Popular People’s Front and the Judean Popular hating the Judean’s People Front. And thrice versa. More about this after the October 23rd celebration. Now there is kolbasz, hot green peppers, cheese, bread, palinka and beer to eat and drink. Hungary, I am eating you. 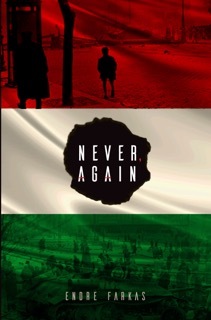 You can hear Canadian author Endre Farkas read from his new novel Never, Again and talk about his recent visit to Hungary. Montreal: Wednesday Nov. 23 @ Beth David Synagogue 6519 Baily Road, Côte Saint-Luc.